Wacław Franciszek Sierpiński (1882 - 1969), a Polish mathematician, is known for outstanding contributions to set theory, number theory, theory of functions and topology. Three well-known fractals are named after him (the Sierpinski triangle, the Sierpinski carpet and the Sierpinski curve). 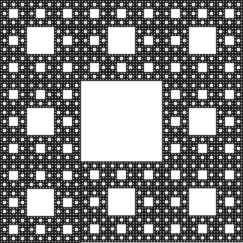 The construction of the Sierpinski carpet begins with a square. The square is cut into 9 congruent subsquares in a 3-by-3 grid, and the central subsquare is removed. The same procedure is then applied recursively to the remaining 8 subsquares, ad infinitum. Using a stand mixer, mix the dry ingredients, then add the butter piece by piece, and process until the dough looks wet and crumbly looking. Toss in the cream cheese and vanilla, and keep going until it starts to form large clumps (30sec). You'll need dough of contrasting colors (food coloring or chocolate). The method starts with an initial pattern. Once that is made, it is stretched out to make it small enough to form the basis of the next iteration, which is in turn stretched out and folded to make the next iteration. To make a batch of chocolate dough, reduce the flour by 1/4 cup and substitute 1/4 cup of cocoa powder. Also reduce the butter by a tablespoon and mix about a tablespoon of melted bittersweet chocolate into the cream cheese before adding it to the dough. Chilling the dough isn't necessary, as you want it to be soft enough to be workable. For the first block, you'll need to roll out eight strips of one color and one of the contrasting color. After rolling them out, form each one into a square, then stack them to form a larger block with the contrasting color in the center. You'll want to slice off the end of the stack to even it up. Use a sharp knife and cut carefully so you don't squish the pattern. To draw the block out longer and thinner without disturbing the pattern, turn it over frequently. You can either squeeze the sides, then rotate, or press the top, then rotate. 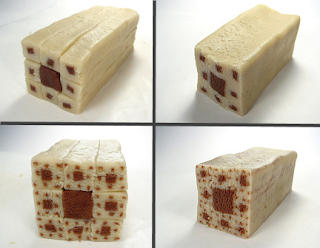 It helps to pull it out twice as long as it was, then cut in half, and repeat until you have eight equal pieces, each about as long as the original block. Parchment paper is a good work surface for this. Keep an extra sheet handy for when the one you're working on gets too sticky. 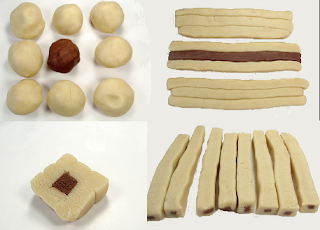 Roll out another length of the contrasting color, using the same amount of dough you used for the original pieces. Form it into a square, and stack the pieces up with the contrasting piece in the center again. As you draw out the block, the edges of the individual sections will merge. If you want to cut samples of the different iterations, this is the time to do it - just after the edges have merged sufficiently. Again, lengthen it until it is twice as long, cut, and lengthen those pieces, cut again and repeat. When you add another piece of contrasting color and stack everything up, the pieces will again be somewhat separate. You will want to draw it out a little smaller to merge the blocks before slicing. With three iterations, it's now ready to slice. (If brave, feel free to try more iterations.) Chilling it would probably be a good idea, but if you're impatient, be sure to rotate between slices to keep the pattern from getting too squished in any one direction. Slice carefully with a very sharp knife or a cheese wire. One final (but optional) step is to gently roll each cookie out to smooth the surface texture out. Leena! this is FANTASTIC! I wonder if I have enough skills to do this. I'm so glad I came by because Blog Carnival is down so I can't get the potluck out until tomorrow. But gee, this has to be my numero uno post because it is crazy wonderful. I hope you contribute more and more in the future! @andrée, thank you so much! 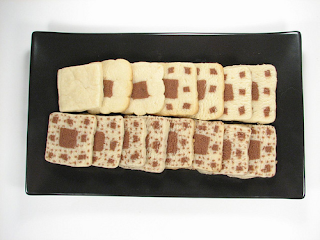 What a great combination of maths and cookies - great way to viciously the theory too! Thanks for sharing!